We offer no-maintenance rollers like no other in the industry, with the only metal parts being the washer and bull ring that hold the roller in place. The two keys to supporting the boat correctly with a roller support system are the number of rollers (weight/roller) and the construction of the roller itself. 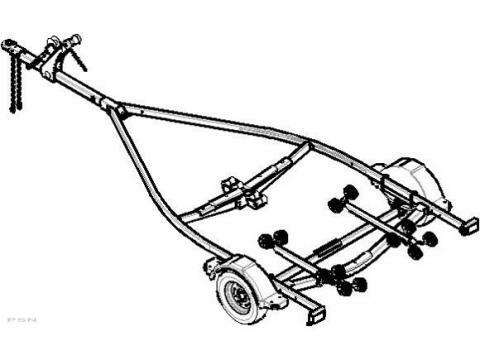 For example, with a 3,000 pound boat on a ShoreLand’r 3,000 pound roller trailer, approximately one-third of the weight of the boat is supported on the front keel cradle and the other two-thirds is supported on the two rear roller arms, each with eight rollers. This equates to about 125 pounds per roller (2,000 pound). The size of the roller and material of construction also play a key role. Our standard roller contacts the hull surface in an area of about one square inch. This equates to 125 pounds per square inch (psi) of pressure each place the roller contacts the hull. Smaller diameter, hard rollers used by some manufacturers may only have .5 square inches of contact area per roller, which increases pressure to 250 psi at that contact point. When the contact pressure exceeds 170 psi, we at ShoreLand’r either add more rollers or go to our cushion roller which has a two square inch hull contact area. Length of Roller Rack: 57 in.